Does your heart beat excitedly at the thought of scaling a building? Or are you filled with a rush of adrenaline at the idea of leaping off a tower? If so, you might want to consider joining some of these exhilarating activities that are available in Singapore. Contrary to the belief that Singapore is a shopping and food-centric paradise for locals and foreigners alike, it actually offers a variety of extreme sports for adventurous souls to try. Gone are the days whereby our only means of pleasure-seeking is to rappel down a bouldering wall or ride a roller coaster repeatedly. Whether be it zip-lining or cable-skiing, there are several activities to cater to different interests. Therefore, it comes as no surprise that there has been a surge in popularity of extreme sports in Singapore, with more people jumping on the bandwagon of ‘thrills and spills’, regardless of their race or nationality. Some older folks have even welcomed these adventure based sports with open arms and participated in activities such as diving or water-skiing. So, if you are looking for an opportunity to unleash your inner daredevil or escape from the monotony of everyday life, these activities might be just right up your alley. For overseas visitors, this might even be a good way to explore Singapore while fulfilling your need for excitement. In light of this, here are 5 thrill-seeking activities that you can try in Singapore as below. If you are a seasoned extreme sports enthusiast, you are probably aware of the necessary precautions and preparations to make before partaking in a thrill-seeking activity. Getting travel insurance that covers extreme sports would be a wise decision if you are visiting Singapore and intend to try out these activities during your stay. Do note that not all extreme sports are covered under certain travel insurance plans, so make sure to thoroughly go through them and opt to sign for additional coverage if needed. Whereas if you are a foreigner who is intending to plant your ‘roots’ in Singapore and staying here for a long time or a local, ensure that your current life insurance plan has an extreme sports component factored in. If you are an expatriate and your health insurance plan is under the care of your company, you might want to consider checking with them about the extent of coverage. This is so as to prepare for any unforeseen circumstances that might occur. Fancy the rush of adrenaline as you plummet from great heights? If so, you might want to give bungee jumping a try. Depending on your level of expertise and preference, you can experiment with different jumping styles while soaking in the view of Singapore around you, thus making for an electrifying experience. Not to be confused with wakeboarding, cable-skiing is a sport whereby you will traverse and glide through water while being pulled along by a cable instead of a motorboat. If you are new to the art of cable-skiing and are concerned about potentially face-planting due to lack of skills, you will be happy to know that there are trainers on-site to guide you through the process. On the other hand, if you are a veteran, test out your skills by trying out the obstacle courses in the form of rails and raised ledges in the water. Think that you have pretty decent arm strength and agility? Well, the tree-based obstacle courses in Bedok might just be suitable for you. 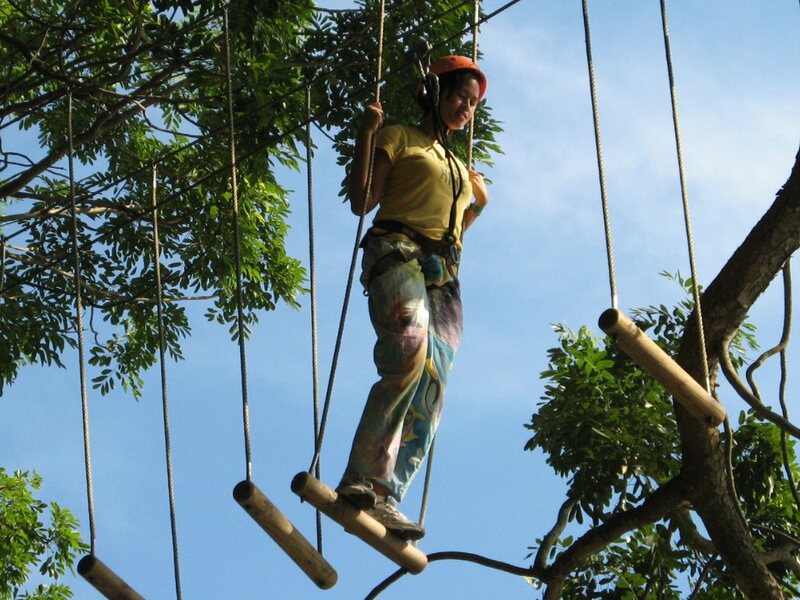 Put your sense of balance to the test by carefully navigating through a series of obstacles like suspended log bridges and stirrups as well as swing from one end to another on a rope. However, do note that they have differing course rates for weekdays as compared to weekends though. So if you are a citizen or staying in Singapore for an extended period of time with more flexibility in your schedule, you might want to opt to visit the tree-based obstacles course on weekdays instead. There are even special discounts for students as long they bring along their identification. Experience the thrill of zipping from one side to another at high speed while being attached to a descending cable line. With the pull of gravity, you will be able to experience accelerated speeds. If you are daring enough, you can also try out different movements and compete against your family members or friends for the most innovative pose or quickest speed. How’s that for some family time or team bonding? Curious about how tightrope performers feel? Why not step into their shoes by doing slacklining? Contrary to its name, slacklining is anything but slack as it requires you to balance precariously on a thin rope that is suspended from a great height. Although the goal is simple, which is to make yourself walk across from one end of the rope to another without falling, it is ever so effective at stimulating a sense of excitement. For those who are worried about the consequences of falling from such great heights, fret not though as there is still a safety harness that is attached to you as you walk on the rope.